A vibrant and thriving Highland community that invites visitors to participate in a wide range of traditional Scottish activities and entertainment throughout the year. Set in the heart of Speyside in north eastern Scotland, Dufftown is situated on the banks of the River Fiddich and the Dullan Water at the foot of the Conval Hills. 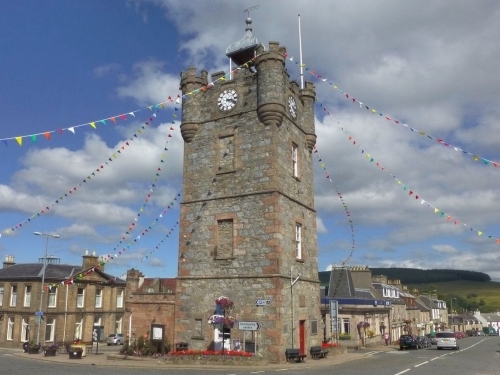 Like other villages of its period, Dufftown has spacious streets laid out in a regular plan. The four main streets converge at the Clock Tower, which was completed in 1839. The Clock Tower was originally the town jail, became the Tourist Information Centre and is now vacant. The Visitor Information Point is now located in the Whisky Museum. Whisky making is the life blood of Dufftown. From the farmers who grow the finest malting barley to the distillers and the coopers, without Whisky, Dufftown could no longer proclaim itself the "Malt Whisky Capital of the World". Whether you already know the north-east of Scotland or are just thinking of visiting, you are sure to find Dufftown and the surrounding area a beautiful part of the Highlands and a unique opportunity to escape from the pressures of 21st century living. For more information about Dufftown why not browse our Dufftown online brochure. Whatever the reason you come here, enjoy your visit and, as we say in Scotland: "Haste ye back!" Following a meeting with the Spirit of Speyside Whisky Festival Chairman, we have decided to change the dates for the Autumn Speyside Whisky Festival from the last full weekend in September to 10 to 14 October. This will avoid clashes with other whisky events in the UK and overseas. September was becoming pretty crowded and with the addition of Whisky Live London it is a prudent move. We are also discussing some collaboration with the Spirit of Speyside. The Whisky Trail bus service is a new service introduced by Stagecoach and allows you to visit 12 Speyside Distilleries with a Sunday service from 1 July to 12 August 2018. The No 36 bus travels through Speyside and links with the No 10 service to Forres and Keith. The Americans have discovered our secret! here is an excellent piece from the Washington Times on 6 Jan 17, well worth a read if you want to have a US view of Speyside! 5 minutes to spare? then why not read this short e-zine article by Paul Stafford who visited Speyside in 2014. His voyage of discovery included a visit to the Glenfiddich Distillery, the Fiddichside Inn and the Whisky Museum. It's well worth a read.